This year's Employee Town Hall features a new format and new location, welcoming all Emory employees to mix and mingle with university leaders at a buffet lunch at the Campus Life Pavilion. 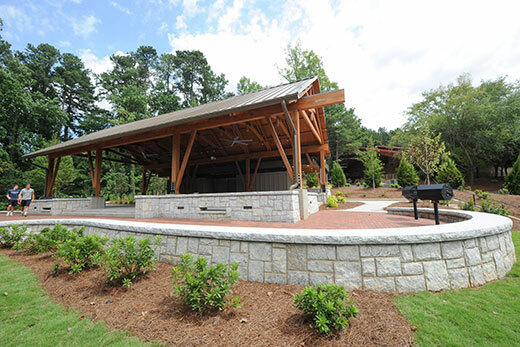 The annual Emory Employee Council Town Hall is Wednesday, April 12, from 11 a.m. to 12 p.m. at the Campus Life Pavilion, located on Peavine Drive across from the Chappell Park baseball field. In case of rain, the event will move to Winship Ballroom. Instead of the traditional forum, this year's format will be a mix and mingle, enhanced with musical performances. Emory President Claire E. Sterk and members of her senior leadership team will talk with employees over a buffet lunch that all Emory employees are invited to attend. This is the first Town Hall to be held at the new Campus Life Pavilion, notes Employee Council President Marlon Gibson, assistant dean of Campus Life. When Gibson took over his role as Employee Council president, he set about making the annual Town Hall into something that reflects the preferences of Emory's new president. Sterk — a regular attendee of past Town Halls in her prior role as provost — enjoys the opportunity to interact one-on-one with members of the Emory community. Stuart Zola, interim provost and executive vice president for academic affairs. During the event, employees are invited to informally pose questions that are top of mind. In past Town Halls, common questions were about transportation services and parking, health care and employee benefits, workplace and work-life issues, and campus safety and other university initiatives. Established to facilitate communication between Emory employees and the university administration, the Employee Council serves as an advisory body to the president.